In part 2 of this series (The Court as a Bully) we saw that the Court is effectively a machine waiting to be activated to operate on some matter or other which an individual brings to the Court. The court is thus powerless to do its own thing and waits, like a servant, to come to life when asked by someone to deal with a case. Most of us have been raised to see the court as a very powerful mechanism to be feared. So it is interesting to reflect on the high level of people power which is involved in legal action. That’s the point of this post. As mentioned above, it is people who activate the court. The court does not activate itself. The court is dormant and uninvolved in the affairs or ordinary people. The court can be ignored by the vast majority of us throughout our lives. The Court has no right to interfere with the normal life of ordinary men and women until and unless a case involving those individuals is brought before the Court. A Court needs “standing” in order to act on a matter. For the court to have “standing” to take up a matter one party must make an accusation against another. The accusation must be sworn under oath otherwise it lacks sufficient validity to engage the court. So the first point about People Power in the Court is that it is People who Activate the Court. It takes People Power to turn the key to get the legal wheels turning. Even when one person has activated the court by filing a writ, complaint or claim with the court the court is not able to do as it pleases in taking the case forward. More people power is needed. In most cases the court must have the agreement of both parties in order to proceed. If one party refuses to allow the court to meddle with their affairs then the court is severely limited. Mind you, this is not a well known fact and the courts probably don’t like me letting the cat out of the bag. In most cases a court is an extension of a problem-solving process between two parties. One party may call upon the court to arbitrate and determine the outcome of a dispute between the two parties. This is usually done when that person is frustrated by how slow the resolution process is going, or the stand taken by the other party. When the court takes up the complaint of one party against another, to become the arbiter in the dispute, both parties must agree to accept the court’s ruling. If one of the parties refuses to authorise the court’s action then it is disempowered. The court cannot lawfully proceed. When I went to the Victorian Magistrates Court to see how things were done I noted that there are mediation processes for some cases. However mediation will not be engaged unless both parties agree to it. This need for agreement is representative of the reality across many court proceedings. The court only has as much authority as people give it. Most people have been trained to see themselves as subject to the demands of the court and government officials, and therefore unable to resist the impositions, judgements and demands made by a court or government official. Because “agreement” to the authority of the court is essential for the court to exercise authority over individuals a series of apparently authoritative processes has been put in place to bluff and intimidate people into accepting the role of the court in their affairs. Such things as a summons, court order, judgement, penalty and fine carry the impression of authority. Remember that the court can become nothing more than a “rent a bully” in the hands of some people. A businessman I once knew shocked me by being completely unimpressed with letters from lawyers and courts. He dealt with them the way it suited him, despite the threats or actions mounted against him. I had so little contact with courts that I was completely convinced that legal action by lawyers and courts was a desperately serious business full of power to intimidate. This man however had been in many legal cases and was completely undaunted, unafraid and unimpressed. 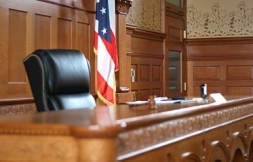 Courtroom architecture and processes give people the impression that individuals have no real “standing” and that the court has all the authority. This really stood out to me when I viewed the Victorian Magistrates Court Virtual Courtroom on their website. Yet in truth it is the individual who carries all the power and authority. The court cannot act at all without being given authority to do so by an individual who raises a case. The individual gives the court standing, not the other way around. If the individual who activated the court withdraws their charges the court suddenly grinds to a halt. It can only act on the authority of an individual. The true authority is the people, not the court. The party being attacked by court process must give permission to the court in order for the court to have any authority over them. Each lawyer must be engaged by the individual in order to have permission to represent that individual. The sworn testimony by an individual in the witness box is the most important resource available to the court. Everything that is not attested to by sworn testimony or witnessed signature is hearsay and of no consequence. So the individual authorises the court, authorises the lawyer and provides the only authoritative resource the court can address. Thus it is absurd that the court so design itself and its processes and paperwork to give any other impression. The reason the courts give the false impression that the individual is powerless and of no consequence is so the court can assert more power and authority than it rightfully has. Individuals are led to give authority to the court, so the court can operate at all and even operate against them. If individuals assign their personal authority to the court, by acquiescence, then the court can operate with power over those individuals. And we all know that power is addictive and corrupts those who hold it. The individuals are in control. They provide the energy for the court to operate. They are not victims of the court but its masters. That is not to say that individuals dictate the law or the outcome of the court, but they are much more significant players in all legal action than they will ever be told they are by lawyers or the courts. Since it is individuals who hold much of the authority in our society and societal processes, such as government and courts, there seems to be much misinformation to convince individuals that they don’t have that authority and to get them to give in, or acquiesce. If a person gives up their personal authority by being bluffed or deceived, they lose that authority and can be ruled easily. Governments and courts like it when people submit to whatever imposition they impose. It makes it easy to govern and to get the results you want when people simply go along with it. Sadly many people’s rightful entitlements have been abused by government and court actions. If you are unfortunate enough to have to confront the court then maybe you should give some thought to who really holds authority in the system and what part you should play in navigating through the processes that may be forced upon you.